Attendees of the second NEXT Summit (Hangzhou 2018) called for multilateral cooperation and against protectionism in Hangzhou on Thursday. 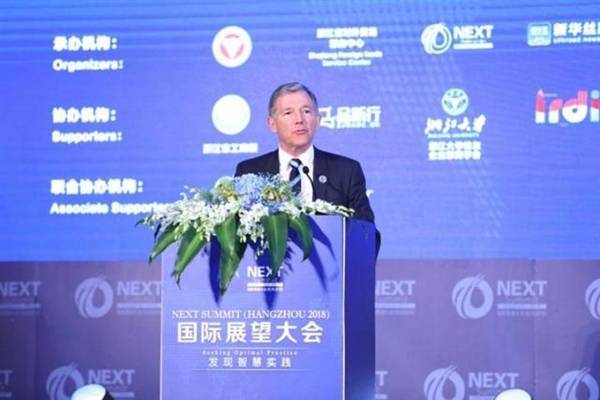 Peter Goodfellow, president of the New Zealand National Party and the Oceania Silk Road Network's honorary chairman, said at the summit that protectionism is not conducive to the development of the world economy, and it is even less in the national interest of New Zealand. He pointed out that China and New Zealand need to work harder to promote international cooperation and reduce trade barriers, praising China for becoming a leader in supporting and promoting free trade in the past few years as well as China's determination to adhere to reform and opening up. The second NEXT Summit kicked off in Hangzhou, Zhejiang province, on Nov. 22, with a focus on optimal practices among some 400 delegates from New Zealand, China and around the world to seek a new pathway for global cooperation, and is jointly hosted by China Economic Information Service, the Oceania Silk Road Network (OSRN), and Zhejiang University. Liu Zhenmin, under-secretary-general for the United Nations Department of Economic and Social Affairs (UN DESA), sent a congratulatory letter to the summit, writing "International cooperation is a timely topic. In the past year, we have witnessed some major challenges in the world economy, particularly the rise of protectionism. These challenges, however, are unlikely to stop international cooperation. Instead, they have highlighted the importance of international cooperation." Ban Ki-moon, the former secretary-general of the United Nations, also attended the summit as a guest of honor. He addressed the summit by saying that both large and small countries should strive for the development of multilateralism and further promote international cooperation. "The world needs interconnections in the fields of infrastructure and finance. It is necessary to establish multilateral mechanisms to promote joint development." added Essam Sharaf, former Egyptian prime minister and chief of the Sharaf Foundation for Sustainable Development. Zhang Yipeng, vice president of Yili Group, believed deepening global cooperation has become a common way for various industries, including the dairy industry, to seek further development. "The complementary resources of all countries can strengthen the quality foundation of enterprise products; the coordinated innovation of countries can enhance the core competitiveness of enterprises in various countries; countries can achieve opening and win-win results and share development results with the world," He said. The summit later held five parallel subforums on five industry areas: public service, energy and infrastructure; robotics, artificial intelligence and blockchain; food, health and husbandry; education, tourism and cultural creativity; innovation and transformation of scientific & technological research. The Hurricane Lamp Award was also set up at the event to award enterprises and promote optimal practices in international cooperation. China Economic Information Service also released its 2018 Report on China-New Zealand Cooperation Prospects under the Belt and Road Initiative at the summit. The inaugural Next Summit was held in November last year in Auckland under the theme of innovation, cooperation and development, to which United Nations Secretary-General Antonio Guterres sent a congratulatory message.